This describes a Lockheed Model 749 Constellation which was delivered new to Qantas in 1947. 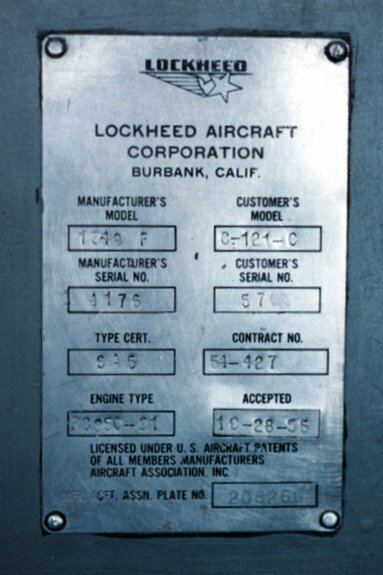 749 indicates that it is a Lockheed Model 749 Constellation. -79 indicates the type of engine fitted, in this case the Wright 749C18-BD1. -31 indicates the interior configuration. This may be unique to a particular customer or it may apply to several customers. In this case the number 31 is unique to Qantas and it describes an aeroplane configured for 42 day passengers or 20 in sleepers plus 2 seated. These numbers lose their relevance after aircraft are delivered to the customer as subsequent changes are commonplace. This describes a Lockheed Model 1049E Super Constellation which was delivered new to Qantas in 1955 as a 1049E-55-118 but was subsequently upgraded. 1049 indicates that it is a Lockheed Model 1049 Super Constellation. E indicates the version of the Model 1049. /01 indicates that the aircraft has been modified after leaving the factory. This is often done by the customer in accordance with a Lockheed Service Bulletin. The 01 indicates that it is the first of such modifications and in this case relates to strengthening of the landing gear to permit an increase in MTOW. Note that it is preceded by a slash and not a dash and it is inserted before the engine type number. -55 indicates the type of engine fitted, in this case the Wright 972TC18-DA1. The engine type has not changed since the aircraft left the factory. - It is common to drop the subsequent interior configuration number (in this case 118) assigned at the factory as this number has lost its relevance for an aeroplane that has been in service for any length of time. Original version of the Constellation delivered to Qantas. Strengthened landing gear to permit increased MTOW. Original version of the Super Constellation delivered to Qantas. Fuselage and wing reinforcements to allow for future fitment of turbo prop engines. Post-delivery upgrade of 1049E with strengthened landing gear to permit increased MTOW. Post-delivery upgrade of 1049C, 1049E, 1049E/01 to 1049G. A 1049G passenger/cargo version with the fuselage and freight doors of the military 1049F/C-121C. Note that the number of seats shown is a guide only as there were variations within each version (e.g. sleeper seats and day seats). Also note that these version numbers have little relevance after the aircraft left the factory as customers would adjust configurations as required. As an example, by 1959, Qantas was operating a 1049G with 82 seats. Lockheed themselves usually describe the aircraft as e.g. "Model 1049". As it is Lockheed talking, stating the company name again is superfluous. For other users, it is necessary to mention the name of the manufacturer and it is usually more convenient to use an abbreviation. You will see all of the above commonly used by people other than Lockheed to describe the Constellation series. This writer has chosen to standardise on Ldash (specifically an endash or hyphen, without spaces). Why did I choose to use a dash? By the time they were building the turbo-prop Electra, even Lockheed themselves were referring to it as the "L-188". This trend continued with the TriStar which was branded "L-1011" so Ldash will do me! This doesn't mean that other variations are wrong or right. For example, the data plate in the HARS Super Constellation shows the Manufacturer's Model as "1049 F" with a space between 1049 and F which is not the usual form of presentation. The Customer's Model (i.e. USAF) shows "C-121-C" which is also unusual as there should not be a dash following 121 and preceding C. Perhaps these variations have more to do with the manner in which characters are punched into the plate so that they don't merge. Although this data plate isn't much help in resolving the matter, one thing it does state quite clearly is that this particular aeroplane had a "Manufacturer's Serial Number", not a S/N and not a C/N. "Super Constellation Pocket Handbook" Lockheed, September 1954.